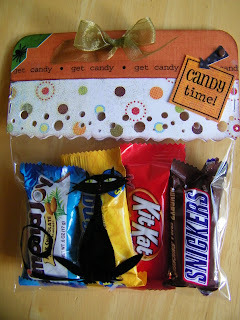 I place 4 different little mini candy bars in a cellophane bag, added some Basic Grey paper to the top of the bag that I had taken an EK Success Bubble Punch and made a border withand I sealed it together with Glue Arts. I added some of the SRM Halloween Sticker Stripe to the bottom part of the orange paper and made a tag from the SRM Candy Time sticker. I added some random stickers and ribbon to finish dressing up my bag. A very simple but wonderful way to make a candy bag.